Gdansk, known as “the world capital of amber“, is the largest port city in Poland, together with Gdynia and Sopot, form “The Tricity”. Gdansk is located on the southern coast of the Gulf of Gdansk and on the banks of the Motlawa River, noted for having a complex past marked by German and Polish rule. 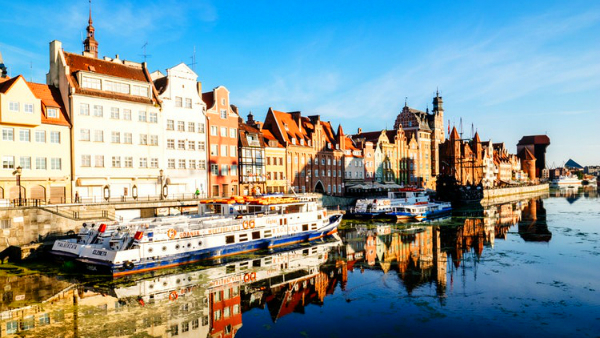 Gdansk has a lively nightlife, a diversity of cultures, medieval architecture and bright colors that make it one of the best tourist destinations in Poland. Gdansk’s cuisine includes traditional Polish ingredients such as cabbage and fermented cucumbers, semolina, mushrooms, pickles, and curdled milk. 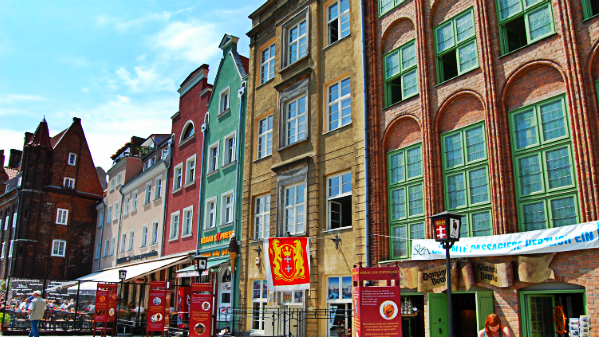 Gdansk has many places of interest such as Dluga Street, where most restaurants, cafes and shops are located. The Town Hall and the statue of Neptune are some of Gdansk most famous landmarks, with the statue being an icon of the city in the Old Town, rebuilt after the Second World War. The best time travel to Gdansk is from May to September, when the city experiences cool weather and cloudy skies, while the winter is long, dry and windy. The public transport in Gdanks includes a network of buses, tram, taxis, and the SKM train system. When recommending the best areas to stay in Gdansk, the Old Town stands out for its outstanding medieval buildings and its central location that allows you to enjoy the nightlife in bars and restaurants (See accommodation in Old Town. The best hotels in the world capital of amber. 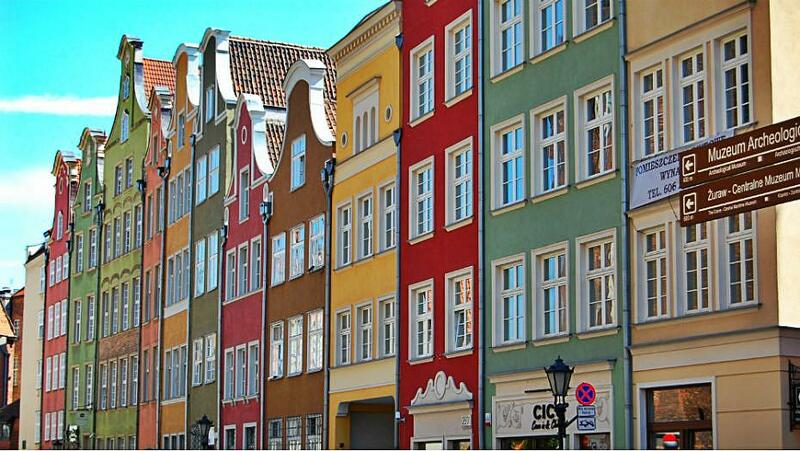 Hostels and cheap stays in different areas of Gdansk. Looking for independence? Book an apartment in Gdansk. Guesthouses, B&B and pensions in Gdansk. The Old Town qualifies as the perfect place to stay in Gdansk because it is located on the north side of the city center. Among the attractions of the Old Town, the Great Mill stands for being a medieval building from the year 1350, which houses a shopping center. Another point of interest is the Central Maritime Museum stands out, known for housing the Granades of Gdansk in the past. The Town Hall, the House of Preachers and several old buildings (kamienice) are also located in this area. 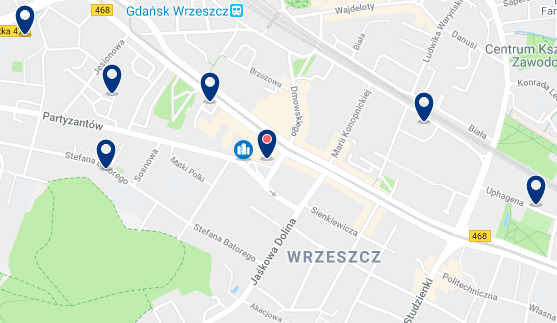 You can access different parts of the Old Town by taking the train at Sródmiercie and Grówny stations. In the Old Town, accommodation costs vary according to the category and there are different types of hotels for all budgets. Therefore, it is recommended among the best areas to stay in Gdansk. Hotel Admiral is 4 minutes from the historic center of Gdańsk and offers air-conditioned rooms with free wired internet. – from €49. Hotel Bonum occupies an 18th century building located in the historic center of Gdansk and is a 3-stars hotel. – from €29. PURO Gdansk Stare Miasto is located in the center of Gdansk, just 2 minutes away from the Green Gate and 3 minutes away from the Long Market. – from €65. Hilton Gdansk is located in the historic center of Gdansk, next to the Motlawa River promenade. – from €89. Wrzeszcz is known as the heart of the student community, an overcrowded area northwest of Gdansk, about 3 miles from the Old Town. 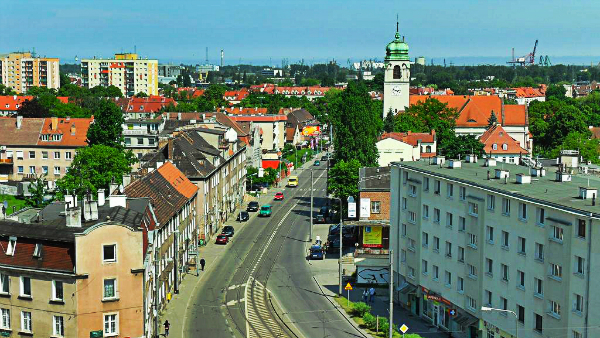 In Wrzeszcz, the means of transport include buses, tram and the railway system. Wrzeszcz has some sites of interest, among which its brewery, the Parish of St. Stanislaw Biskupa M? Czennika, the Dwór Studzienka, and the Parish of St. Stanislaus Bishop and Martyrson stand out. This is one of the best areas to stay in Gdansk for shopping, as it has malls such as the Baltycka Gallery and the Centrum Handlowe Manhattan. In addition, its striking housing complexes, mansions, and medieval buildings make it a very picturesque place. Smart Hotel is located in Gdansk and houses a library. It offers rooms with free Wi-Fi. – from €42. Hotel Logos is located in the city of Gdansk, just 130 meters from Grunwaldzka Avenue. – from €30. Focus Hotel Premium Gdansk is located in the Wrzeszcz district of Gda? sk and offers free access to a sauna and the hotel gym. – from €49. Przymorze is divided into Przymorze Male, which is the administrative district of Gdanks and Przymorze Wielkie, which includes the modern and commercial part. Przymorze Male is surrounded by large gardens, such as Park President Ronald Reagan and Kraina Zabawy Children’s Park. Przymorze is considered one of the most important districts of Gdansk, as it is a coastal area located in the northern part of the city. 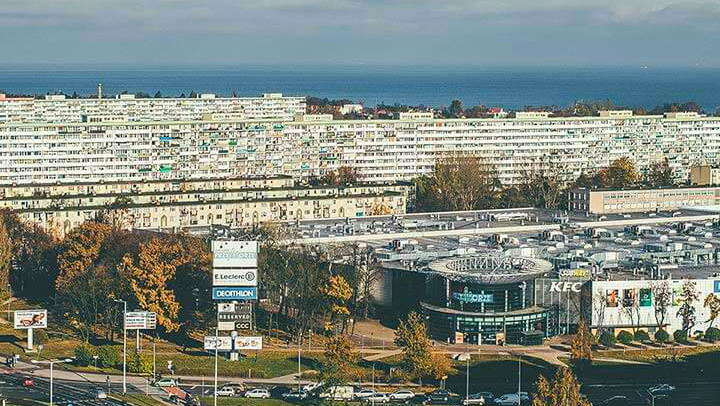 Przymorze Wielkie is a residential area with few attractions, but with some malls and sport-related shops that make it a good choice of accommodation to go shopping. It is easily accessible from the center of Gdansk by taking the train to the nearest stations, such as Oliwa and Przymorze – Uniwersytet. Best Western Plus Arkon Park Hotel is a modern 4-star hotel with air conditioning and offers elegant rooms with free Wi-Fi, a modern fitness center and a relaxation room. – from €42. Brzezno is one of the most visited neighborhoods by tourists in the city of Gdansk and is famous for its beaches and the pier. Visitors prefer Brzezno for its beaches, medieval fortifications and for being a charming fishing village. When choosing activities in Brzezno, it is recommended to enjoy a day at the beach, stroll along the Brzezno Pier, ride a bike along the Sopot route, or tour the Brze?Nie?Ski them J. J. Haffnera park. When taking a short holiday, it is recommended to stay in Brzezno as this is one of the busiest areas for tourists in Gdansk. Hotel Lival has rooms with free internet access and sea views. – from €50. Jelitkowo is considered one of the most popular tourist destinations in Gdansk since it is in the mesoregion of the Kashubian coast. It borders the Baltic Sea to the north, and Przymorze to the south. 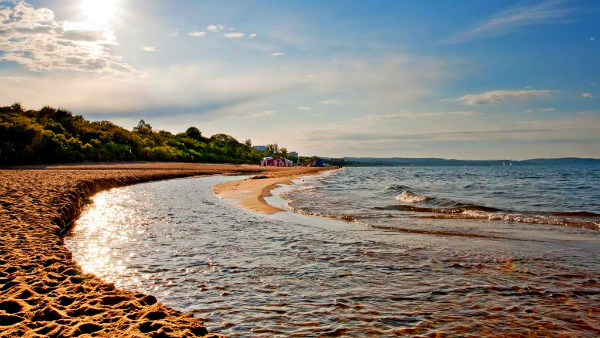 Here, it is usual to enjoy the beach, the Park Jelitkowski, take a bike ride on the route from Sopot to Brzezno or visit the old fishermen’s houses in the 18th and 19th centuries. The main streets of Jelitkowo are Pomorska, Piastowska, Kapliczna, and Jelitkowska. Jelitkowo is, without a doubt, one of the best areas to stay in Gdansk, for its wide variety of hotels for all types of visitors, as they adapt to the budget and travel motive of any tourist. Novotel Gdansk Marina has an indoor pool, sauna and fitness center, all free of charge. – from €47. Grand Apartments – Neptun Park is a self-catering accommodation located in Gda? sk, in the middle of a park, the apartments are very bright and have a flat-screen TV. 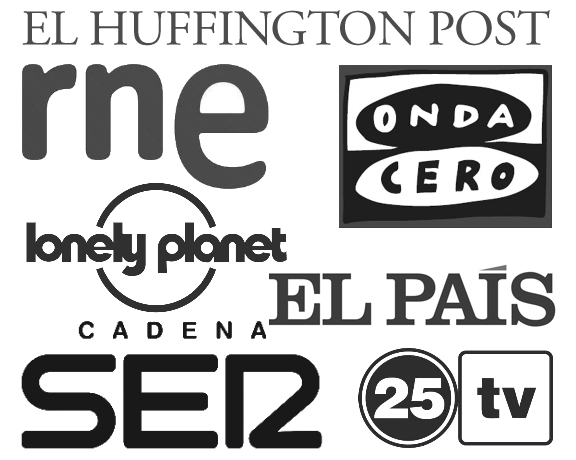 – from €37. Mercure Gdansk Posejdon Hotel offers spacious rooms for non-smokers, swimming pool, fitness and wellness facilities, as well as a conference center with 6 fully equipped conference rooms. – from €49. |ES|Dónde dormir en Gdansk – Mejores zonas y hoteles.